Premier Gladys Berejiklian and Education Minister Rob Stokes visited Penrith Public School today to see work underway on the school’s $10 million upgrade. 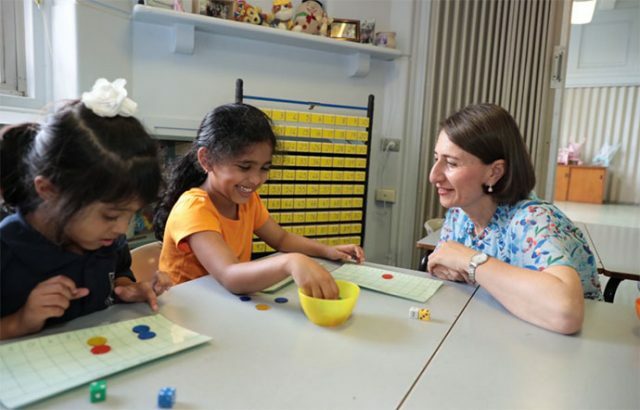 Ms Berejiklian said Penrith Public was one of 190 new and upgraded schools being delivered across NSW as part of the Liberals & Nationals’ record $6.5 billion school building program to support local communities. This is on top of the 80 already delivered. “It’s fantastic to visit Penrith Public School to see yet another world-class school being built for the growing western Sydney community,” Ms Berejiklian said. Penrith Public School’s upgrade will be completed next month and includes 12 new air conditioned classrooms in a new two-storey building. Mr Stokes said more than 80 new and upgraded schools are being delivered in Western Sydney alone – a $2.1 billion investment that will create about 13,000 jobs. “Greater Western Sydney is growing and we are investing record amounts to ensure that children in these areas have the best quality education possible,” Mr Stokes said.